! 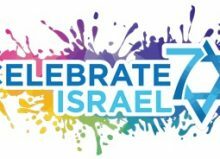 לעת עתה ולנצח נצחים Israel celebrates its 70th anniversary as an official State, approved and confirmed at the time by the United Nations. See here, including the statement by Theodor Herzl and the Balfour Declaration, which has been in existence for 100 years since November 2017. For a brief history of Israel, with timeline, read this. And for Israel’s top 45 inventions, see here. Beloved Israel, congratulations on your 70-years anniversary, לעת עתה ולנצח נצחים, for now and forever!